Can I Reuse Someone’s Deleted Content? 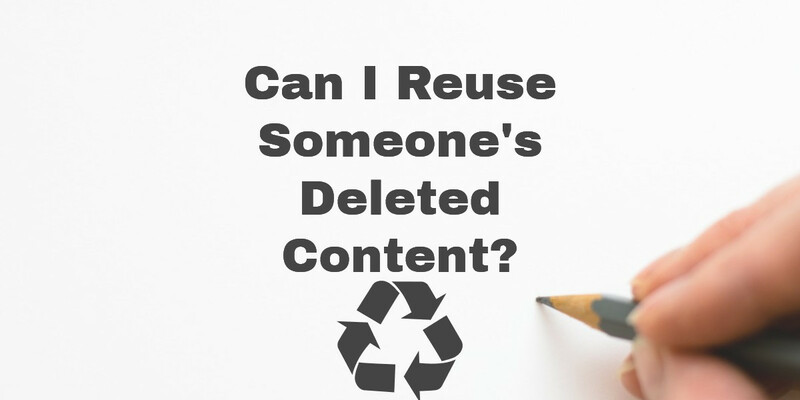 Home → Content Creation → Can I Reuse Someone’s Deleted Content? It never ceases to amaze me when people are willing to delete content. Today I discovered a California law firm which had recently deleted hundreds of articles from their blog. This was great content which is extremely valuable in the right hands. It just so happens I have the perfect place to resurrect this particular content. I call this content recycling. I know what you’re thinking: who in their right mind deletes content?! Should I delete my content? What if my SEO company deletes my content? Apparently, a lot of “SEO Experts” like to delete people’s content. If your SEO guru suggests this to you, either you have some really, really terrible content, or they are an idiot. From a technical SEO point of view – once the content is deleted from a website and Google crawls the site, they will soon delete the content from their index. This may take a week or up to 120 days, depending on how often they crawl the site. On some occasions, Google will check a site two or 3 times to see if the content went back up or not. If the entire domain has been deleted or is replaced with a single landing page, the content will be removed form the Google Index shortly thereafter. Once that occurs, you are free to use the content again with no harm from the search engines. If you place it on your site, expect it to show up in search results immediately with no problem. From a legal standpoint, if and when you can reuse content depends on the unique situation. If the content belonged to a personal blogger or a small business and you know they have no clue what the hell they’re doing, I’d say go for it. Is this 100% legal? I honestly have no idea. But to sue you they’d probably have to show, in great detail, exactly how you harmed them. If you’re using something they threw away, you should be fine. Of course, you probably shouldn’t reproduce a book or other copyrighted material. Just use some common sense here. If someone is dumb enough to delete their content, go ahead and use it. As long as it isn’t indexed anywhere else on the web, search engines will see it as 100% unique content. They’re not tracking content which is no longer online, just be aware of why they deleted it- was it poorly written, useless content? Or did they delete it out of complete ignorance?